If you require assistance using the Account Administrator Change Request form, please contact the 24/7 Help Desk at 412-624-HELP (4357). As an RC Admin, you will have access to the RC Administrators SharePoint site. 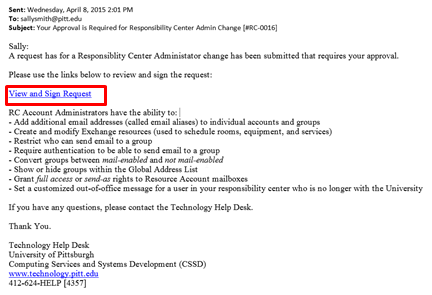 To access the RC Administrators Change Request Form, you must use a Java-enabled browser. Note 2: If you cannot access this community on My Pitt, the change request form is here. Log in to My Pitt with your University Computing Account username and password. Search AskCathy for RC Administrator. Click RC Account Administration from the results to launch the SharePoint site. 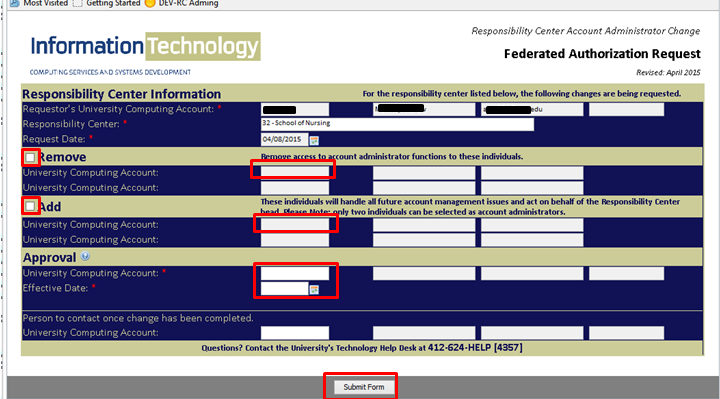 Click Submitting the online form in the right-hand column. Your username and contact information will be pre-populated for you, as well as the Responsibility Centers you control. Select the Add or Remove options you wish to perform, then enter the computing account of the users you wish to modify. Their information will be retrieved from the directory. You must also identify the Approving user. This is a Responsibility Center Head, or someone with the appropriate responsibilities to approve such a request. This request will not be processed without their approval. If desired, you may also enter an additional user who will be notified upon the completion of this request. This selection is in addition to the submitter, approver, and users being changed. When you are finished, click Submit Form. Once the form is submitted, the Approving user will receive an email notification to approve this request. Upon approval, it will be processed by Pitt Information Technology Security. You will receive an email notification when a form has to be signed that needs your approval. Click the email link to the form that needs to be signed. Enter your University Computing Account username and password. Note: The change request service uses the Pitt Passport single sign-on service for multifactor authentication. You will be presented with the submitted form. To edit the form edit, you must Check out the form by clicking the in the bottom toolbar. A comment box is displayed. 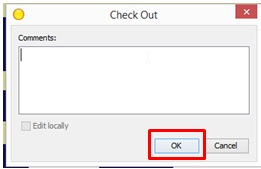 Click OK.
Now the form is editable. Press the Click to Sign box. Note: Only the Approving user will be able to sign the form. Once completed, Check in the form. Note: If you are prompted to check in the form, select Yes. 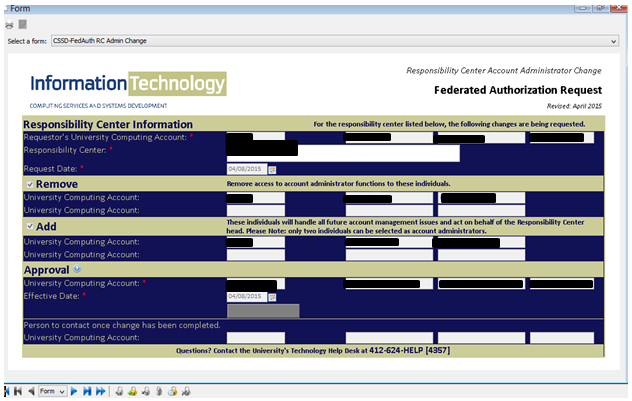 The form will be routed to Pitt IT Security for processing. Users will be notified once it has been completed.